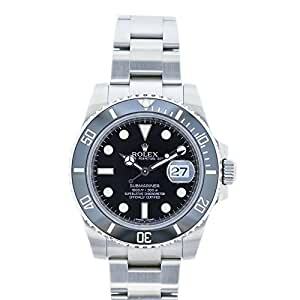 Rolex stainless steel Submariner, automatic, size 40mm. Rolex ref. 116610 with a stainless steel case and Oyster bracelet, black index dial, magnified date display, black Ceramic rotating bezel, luminescent markers and hands, sapphire crystal. Circa 2010. . Buy with confidence knowing each timepiece goes through the same rigorous 31-point inspection. Rest assured only authentic parts straight from the manufacturer are used. The Certified Pre-Owned Program on Amazon ensures peace of mind and transparency via standardized reports and a 1 Year Warranty Provided by WatchFacts.